I returned home to Absarokee, Montana after a 36 hour trip on 17 – 18 November. After debriefing and reflections with my colleagues and downloading the many photographs I’ve realized that it was a remarkable trip. I’ve assembled a series of photographs which to me portray the “faces of progress” we met in Uganda. At about 70, Oppobo Witty is one of the oldest Ugandan men I’ve met. He is a survivor of the LRA War in northern Uganda. Five of his sons were killed by the LRA, four of them in one night at his family compound near the site of this photograph. He has been our “bridge” between the community of LRA refugees and the current resettlement of their ancestral lands in the north. He now advocates for clean water and better living conditions for his surviving descendants and all residents trying to resettle Northern Uganda. Hope 2 One Live (H2O) and HydroSolutions assisted with the installation of a new well on his family’s property which replaced contaminated surface waters and will be used to supply water to a new drip irrigation system. Richard Angoma is shown here in front of the twin water tanks served by the solar powered well sponsored by H2O with HydroSolutions assistance on the FEM Farm that he manages. This multi-talented man is responsible for orchestrating an amazing turnaround in the fortunes of the many LRA war refugees who resettled on the FEM Farm near Masindi, Uganda. On my first trip to the Farm in 2008, water borne diseases and malnutrition were still prevalent among the 40 families resettled there. Today, other than a few families who chose to stay, there are no more refugees on the Farm, and people generally have adequate food. After helping making safe drinking water and drip irrigation available to residents, Richard is now leading grassroots economic development efforts among the surrounding villages. Sister Zapporo (center) of the Little Sisters of the Immaculate Heart of Mary in Opit, Uganda, just received her Masters Degree in animal husbandry from Makerere University. She is pictured here with her staff and mother superior in a new goat house built on the Sister’s property. The goat breeding project, funded largely by Montana donors to Hope 2 One Life, Inc (H2O) of Billings, will provide income both for the Sister’s education and community work, and for financial support of the health care clinic built by H2O which improves access to care in a rural area of central Uganda. HydroSolutions assisted with installation of the well which serves this farm. Terence Acaye (on left) was for many years the head of the Kitgum Infant Care Center which received and cared for the most helpless of victims of the LRA War in northern Uganda. Terence now is our “go-to” person for coordination, scheduling and organization of humanitarian aid to northern Uganda. He is a skilled manager, knows the local language and customs, and also speaks our western way of doing business. Without him, we would have a very difficult time accounting for the money spent and work performed there. He will be serving as a mentor for the next generation of Ugandans leading development of the post-war era. Bosco Tolit (in red) is shown here holding a component of a ¼-acre drip irrigation system he is installing at the Lariabe village near Palabek in northern Uganda. With a degree from Makerere University, he has returned to his ancestral lands to assist with implementation of economic development programs to improve lives and sustainability. Recent disruptions in weather patterns have left the people of this region facing hunger. Drip irrigation from water wells sponsored by H2O with assistance of HydroSolutions offers hope that vegetables can be produced even during the upcoming dry season. He worked closely with me on this trip and will be downloading the water level data collected by the transducers we installed on this trip. Bosco’s desire to serve his people is a shining light of hope for this country and offers a channel worthy of our future support. Murchison Falls on River Nile, where it crosses the western rift zone between Lake Kyoga and Lake Albert. This is one of the world's most powerful falls due to volume and pressure, as 300 cubic meters per second (10,500 cfs) is squeezed between a gap that's about 7 meters (23 feet) wide and tumbles 43 meters (141 feet) down. Tom and the team will soon be making their way back home. They'll have more photos and stories to share upon their return. As we have in previous years our team was led this year to Palabek in far northern Uganda by Oppobo Witty who lived on this land many years but was displaced by the LRA War. He had five sons killed by the LRA, some before his eyes. But survivors of his family have recently resettled here and are trying to reestablish farms and communities. Although it is not known outside this region, sustenance farmers in this area are facing famine and severe hunger. The typical wet and dry season cycle was disrupted by El Nino, according to local opinion, causing the last crop to fail in September when normally wet conditions turned dry. Although it is raining now, the next crop is not ready. We were able to distribute sacks of dry food such as beans and maize to alleviate the immediate hunger. But we also brought seeds so that their next planting season would be good. A few items we brought to Palabek were big hits, namely the soccer balls, baseballs and bats. The kids here have no toys- nothing. So a real toy brings all the kids running and cheering. The other item the women were delighted with was a ¼-acre drip irrigation kit. This will allow them to irrigate vegetables during the dry season using groundwater from the nearby water well we drilled in 2014. Deployinging the In-Situ transducer into the Palabek water well. We took water samples from both Palabek wells for E. Coli bacteria. We chose the more productive of the two wells to install one of the donated In Situ Troll 100 transducer. This instrument will allow us for the first time to monitor seasonal water level and temperature trends, and also see the effects of daily pumping by area residents. The data will contribute greatly to our understanding of the sustainability of the groundwater resources in Uganda as people increasingly turn to this resource for clean drinking water. We are grateful to the In Situ Company for their generous donation. Two chickens presented to Tom and Hope 2 One Life team from Awere village. Today we traveled about 60 km to a small village called Opit and another called Awere. We were formally received in Awere with a village delegation, dancing and singing, and speeches from the village leaders. Their water well broke 7 months ago and we sampled a spring they are now forced to rely on for drinking water. As the spokesperson for H2O, Tom was the proud recipient of two plump chickens given by the village in honor of our visit. At Opit we met the Little Sisters of Mary Immaculate of Gulu for a tour of the newly constructed goat house and fence. H2O has entered a business partnership with this community of nuns for rearing of boer-cross goats to sell to support our clinic on the FEM Farm. Sister Zapporo there has formal training in agricultural and animal husbandry. Moreover, she is a ball of fire and totally excited to jump into this project. H2O drilled a new water well at the goat property. We chose this well to monitor water level trends and temperature with the Solinst Levelogger transducer, donated by Solinst of Canada. This instrument will give us a long term record of seasonal water level trends and impacts of daily pumping for human and animal use. Such data are not available that we have seen. We are grateful to Solinst for this generous donation. Deploying the Solinst Levelogger transducer into the Opit goat property water well. It was good to see the people of the Palabek villages where we drilled to water wells in 2014. However it was disturbing to see that they were close to starving because the crops planted in September have failed due to early dry conditions. Now it is raining again but they do not yet have a new harvest. Everywhere we went in northern Uganda people were blaming El Nino for the disruption of the normal wet and dry seasons. Everyone was concerned about their crops. We did introduce a one quarter acre drip irrigation system to the Palabek villages which will be served by water from one of our boreholes. This will allow the growing of some vegetables during the dry season which begins soon. Today we go to a village named Opit where we have partnered with a community of Ugandan nuns to raise goats which we hope will supply income to support our Clinic on the FEM farm. phreatophyte. The borehole was installed near here. 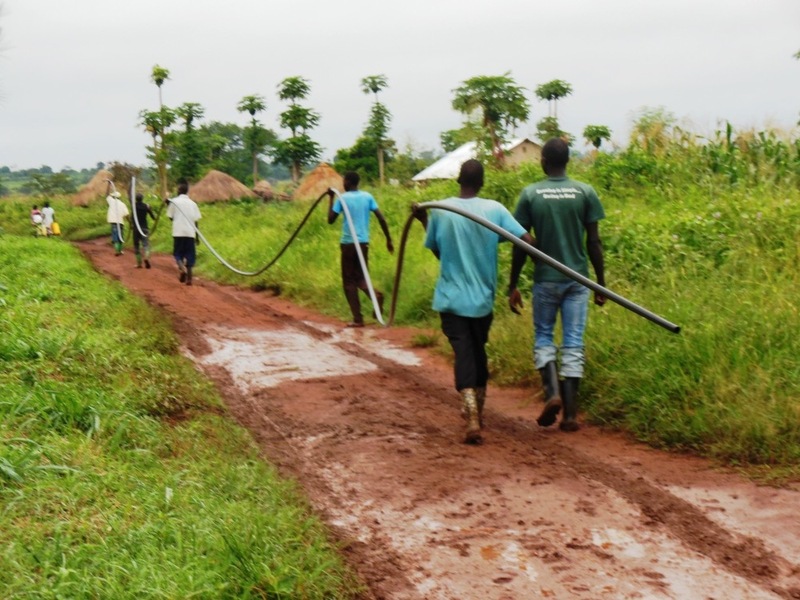 The local men carrying the conduit pipe I inserted into the East Well on the Family Empowerment Farm in which Solinst transducer was inserted, 55 meters long. Moroto west Water board are the local people who comprise the water board overseeing care of the two boreholes H2OL drilled near Palabek in 2014. Water Walk on the Family Empowerment Farm (FEM) near Masindi Uganda, a well H2OL drilled in 2007. Multiple photos here showing how Ugandans locate, convey and manage their groundwater resource. Work continues in northern Uganda. Roof water storage tanks which are part of a greenhouse irrigation system to grow food for disabled Ugandan children attending a boarding school in Kitgum, UG. 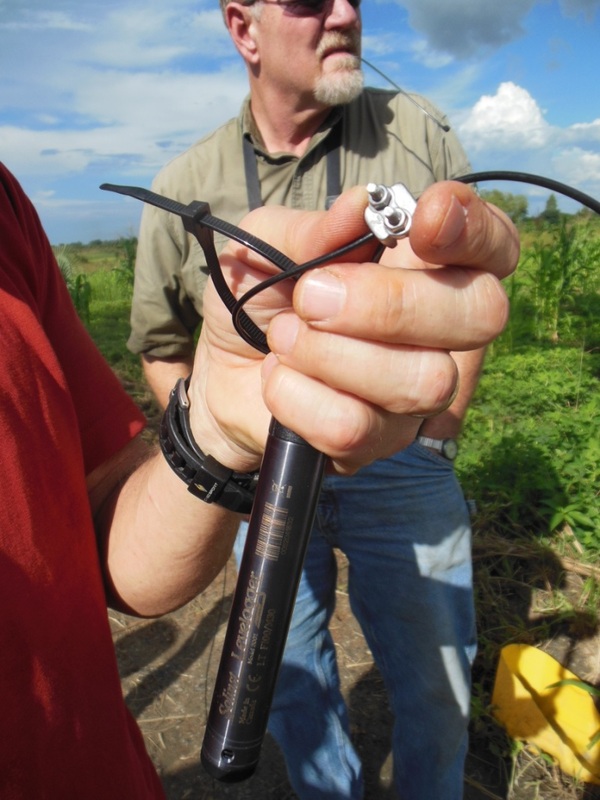 Tom inserts the first In-Situ transducer into the Moroto West well near Palbek, UG, in the far north. The team of water well workers. Post from Uganda 9 Nov 2015. East Well insert is the first Solinst transducer being inserted into the well on the Family Empowerment Farm near Masindi, UG. I had success today installing the first transducer in a hand pump well on the Family Empowerment Farm near Masindi. We relied on a local borehole technician to take apart the well head assembly. We inserted 50 meters of HDPE tubing as a conduit and bolted it to the well casing. The transducer was then inserted into the tubing to a depth of 31 meters, 15 meters beneath the static water level. There is no electricity so the bolt holes had to be drilled with a small hand drill. That took two hours. There were eight local men helping handle the work. Quite a fire drill at times. Naturally the bolts I had were too short so I had to run to the hardware store. That entailed me hiring a local boda boda driver to take me about 8 kms through the bush to the nearest village. We must have goneto 10 little shops to find a 3 inch bolt. We finally got the project done and water pressure andtemperature data are being collected on 15 min intervals. It will be used to evaluate the sustainability and use of the groundwater resources in rural Uganda as we seek to further provide clean water for impoverished people here. Tomorrow we are off on a 6 hour drive north to Kitgum and attempt to do the same project at wells there. This are is still being resettled following the LRA war. Greetings from Uganda. After arriving at the refugee Farm after midnight and a 200 kilometer drive from Kampala, we had a busy first day on Friday. We met with the people of the farm to discuss ways to improve their farming methods and generate income. They have much interest in improving farming methods. We discussed why the tomato crop failed last year. This apparently was due to the fact that they planted too many acres and did not have sufficient water for drip irrigation. Today, Saturday, we are running bacteria testing of the water wells, conducting soil fertility testing, and preparing to deploy the transducers into of the wells on the farm. It is the end of the wet season here and everything is very green and lush. So far, it has been sunny during the day with light showers at times. Temps are pleasant.